In this blog post, I’d like to show you how the mount SD Card Android process takes place and in particular, how to configure Android in order to auto mount a new SD Card when plugged in. The situation in which the mount point is different from /mnt has been considered as well. The following code has been tested on the Ltouch F Android tablet for industrial and home automation projects together with Android Gingerbread. 1. Identify the sys_path of the SD card device. Go to /dev/block/platform and list all the directories. In my case, I find the following directory: s3c-sdhci.3. 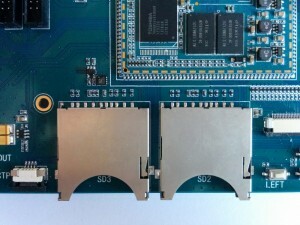 This means that the SD card is inserted on the slot number 3. 2. To automatically mount it whenever the card is plugged in, you have to modify the vold.fstab configuration file. This file is usually located in /system/etc and you need the root permission to add your configuration commands. in order to mount the system partition as writable (before opening a shell terminal). where “sdcard” is the label associated to the volume, “/mnt/sdcard” is the path of the mount point in which you will find the SD files, “auto” specifies which partition to use and, as the header description suggests, it selects the first usable partition. The latter parameter specifies the path of the source device. Here I used /devices/platform/s3c-sdhci.3/mmc_host/mmc3. It is formed by a first common part “/devices/platform”, the directory part s3c-sdhci.3 that comes from point 1 and finally by the mmc_host/mmcX (where X usually identifies the number of the SD card) that specifies the type and number of the resource. In case you need to configure a dual card setup but you have the /mnt/sdcard mount point already assigned to another volume you have to add a new mount point in /mnt or in other folder. Please remember that the /mnt folder is remounted at every boot therefore every modification you made inside of it (such as creating new folders) are not persistent and will be discarded. /* This is the master Users and Groups config for the platform. ** DO NOT EVER RENUMBER. /* The 3000 series are intended for use as supplemental group id's only. That’s it. Reboot the system and checks whether plugging in a new SD card, it will be mounted on the just created folder. If you liked this post, please share it! Comments and suggestions are always appreciated! This entry was posted in android and tagged mount, sd card, vold by biemadmin2012. Bookmark the permalink.